Director Vijay Milton's 10 Endrathukulla is marred by overzealous performances, ordinary music, tacky CGI and poor execution, warns S Saraswathi. 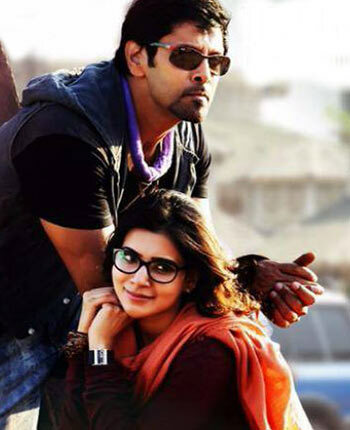 It is hard to believe that Vikram's 10 Endrathukulla is directed by Vijay Milton. The director's earlier film Goli Soda was an action-packed entertainer and one of biggest hits of 2014. 10 Endrathukulla is not in the same league. The much-hyped road film jointly -- produced by AR Murugadoss and Fox Star Studios -- barely manages to hold your attention. The first scene has Vikram's car taking a giant leap through a bridge, somersaulting in the air, landing atop a speeding train, and continues as one ludicrous scene after the other. Vikram is a daredevil car driver, who is forced to take up jobs ferrying illegal goods to provide for his comatose sister. Interestingly, he has no name in the film, and calls himself James Bond, Mani Ratnam or Sunil Gavaskar. He meets Shakeela (Samantha) at a driving institute, where he is a trainer. An orphan, Shakeela is determined to earn her driving license. The director has the pretty Samantha play a dimwit, who loves to make a fool of herself. The jokes become stale after a while. Meanwhile, we have a small-time goon Dass (Pasupathy), who hires Vikram to transport a vehicle from Chennai to Mussoorie in Uttarakhand. What he fails to mention is that a kidnapped Shakeela is lying unconscious in the car. The first half meanders aimlessly with a number of unnecessary songs at regular intervals, while the lead pair are busy falling in love. But the second half takes on a more serious note. The buildup is enormous, as we are introduced to terrifying villains, played by Rahul Dev and Abhimanyu Singh. There are violent caste clashes, and an unknown person is soon to be hanged for the crime. The director connects the dots between this mysterious person and Shakeela's kidnapping at the very end. The road trip that was to be the crux of the film is almost nonexistent. The car chases are unremarkable and the over-the-top graphics utterly ridiculous. There is barely any chemistry between Vikram and Samantha, who seem too enthusiastic and appear to be overplaying their parts. Pasupathy, as the greedy goon with his straight face and casual dialogue delivery, provides plenty of laughter. The quietly menacing Rahul Dev is impressive as the bad guy. Though a decent plot, the director in his attempt to make it bigger and better than his previous film, has perhaps added too much melodrama. Director Vijay Milton's 10 Endrathukulla is a tedious road film marred by overzealous performances, ordinary music, tacky CGI and poor execution.